Oscar Pistorius, the “Blade Runner,” was found Not Guilty of premeditated murder this morning in a South African court by Judge Thokozile Masipa after a 6-month trial. 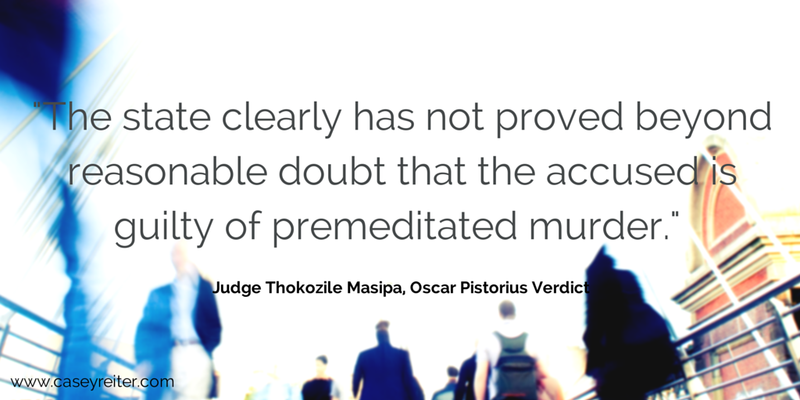 Masipa found that the State did not prove the elements of premeditated murder beyond a reasonable doubt, and that Pistorius did not have the intent to kill his girlfriend, Reeva Steenkamp. Pistorius has been a fixture in the news after he was charged with one count of murder and three firearms charges stemming from the shooting of Reeva Steenkamp on Valentine’s Day in 2013. Both prosecutors and the defense agreed that Pistorius had killed Steencamp by shooting into a closed bathroom door. However, the defense argued that the killing was not intentional murder because Pistorius did not know Steenkamp was in the bathroom; he believed he was shooting an intruder. Although the Judge has ruled that Pistorius cannot be found guilty of premeditated murder, Pistorius is not completely out of dodge yet. He still faces additional chages and could be sent to prison for up to 15 years if the Judge convicts him of culpable homicide or negligent killing. The Judge is scheduled to reconvene the judgement phase of the trial on Friday to address the other charges. If Pistorius is convicted of any other crime, there will also be a sentencing phase in the future.